In the Northeast, every season has its special quality. While winter brings the cold chilly weather for a few months, it also ushers in a variety of amazing events and travel destinations that are too good to miss. Even if you are not into winter sports – there is still so much to experience in the Northeast this season. Here’s a quick guide of winter festivals, events, and places to discover that make the perfect trip for your group. So many amazing things are born and made in Vermont! Blown glass, cheese, incredible ice cream, chocolate, pewter, furniture and teddy bears are just a short list, The winter months are a perfect time to go to the places that create them, and watch them being made. Factory tours are abundant. Then there are the small, unique and friendly cities – like Bennington, Brattleboro and Burlington (and there are also others that do not start with the letter ‘B’). Maple syrup and Vermont are synonymous, and you will find more sugarhouse tours than you can imagine. Antiques, art and covered bridges, museums about the the Revolutionary war, how they quarried for marble and other early industries – all in a day of Vermont exploration. General store and specialty shops are scattered about, and the rich variety of local cuisine ensures both fine and casual dining experiences. A stand-out seasonal event in Rhode island is the Newport Winter Festival that is happening this year February 16th to the 25th, 2018. The festivities include food, fun and music. Cooking competitions include the best mac and cheese, the best hot drink and the tropical drink contest, and the much-anticipated chili cook-off. This year there is also a musical tribute to the classic rock band The Eagles. You and your kids can participate in the Princess Party. When you buy an event bracelet for the festival, a whole number of participating restaurants and retailers in the area will also give you discounts and specials. There are a whole variety of inns and resorts that are super cozy during the winter months. Loon Mountain, Cannon Mountain and Attitash are three that come to mind. They have spas and all the creature-comforts you could possibly need. In the area are some of the states most incredible and beautiful villages – ones that really shine in the wintertime! Intervale, Glen, Bartlett, Hart’s Location and Jackson are the cream of the crop. Take in the scenery filled with snow capped mountains, ancient historical churches with high steeples, all the covered bridges and acres and acres of farms and rolling terrain. Cap the days off with a hearty soup or stew from your choice of fine eateries, and spend a siesta during the afternoon sipping a hot cocoa or tea in a vintage-looking rustic café while you gaze out into the winter wonderland right outside. Kennebunkport is one of the places to make your prime destination. It’s a real Maine getaway. And it comes alive in the cold weather. Unique shops, classic hotels, great restaurants and lots of galleries. 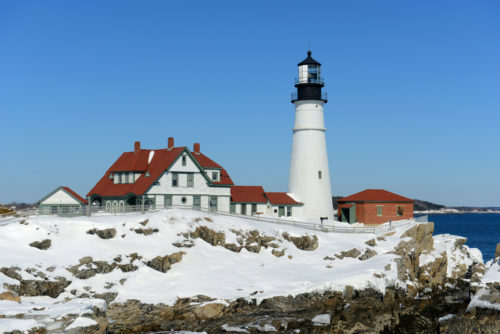 Portland is a coastal town, and is Maine’s largest city. Seafood and more seafood, and an art focus prevails throughout the town. Old Port is a great spot in the world that you will cherish. Bar Harbor is the epitome of small town Maine. A waterfront village with galleries, charming shops and excellent local cuisine. Big city culture continues during the coldest months of the year. The Museum of Fine Arts Boston. Through early January 2019 runs the French Pastels Treasures from the Vault exhibition, and for the young at heart is the Winnie-the-pooh: Exploring a Classic offering. There is also the Museum of Science, the Isabella Stewart Gardner Museum and the Museum of Fine Arts. A great excursion would be catching a film at the historic Brattle Theatre. The Boston Symphony Orchestra is also an enticing option! People often talk about winter wonderlands. In Connecticut, they talk about winter wine trails! There is an experience to be had in the western region of the state, sponsored by the Lichfield Hills program, and the CT Coast & Country promotions also embody wineries in Guilford and Wallingford. There are also similar offerings by the local distilleries. Indoor farmers markets are plentiful, and there are unique things to do – like late-night theater at the Yale Cabaret. And for those who want to have a quite quirky destination, how about the Pez Visitor Center, which houses the largest collections of Pez dispensers, attached to the factory that makes and supplies the world with all those tiny rectangle Pez candies every day. There is a lot you can pack in. Or perhaps you wish to pull back and slow down the pace. Or alternate busy days with kicking back days. Our quality team at Coach Tours is here, ready to assist you. Why not just call for an initial chat? Tell us about your group and your winter wonderland desires. We can collaborate in putting together the perfect itinerary that covers all the logistics and destinations, and get you and your group into the most comfortable seats with the most professional drivers, transported to a wonderful winter wonderland by tour bus company that consistently has the best safety ratings. Call today – winter is right around the windy corner!